A runner declared out for failure to touch a base cancelled a run on appeal, prolonging a tied ballgame and sending it to extra innings as the apparent winners filed a protest over the call. How will that protest play out? Such is the question posed in this edition of Ask the UEFL, concerning a recent Federation playoff game between Lee County and Johns Creek High Schools in Georgia. Executive Summary: The rules-related controversy stems from, what else, but an attempt to apply professional baseball rules (OBR) to a high school game, which is subject to National Federation of High School (NFHS) rules. The umpires enforced the NFHS rule correctly; this protest should be denied. The controversy arose during the seventh inning of the second game of the Class 6A semifinal doubleheader in Leesburg Wednesday. Lee County won the first game 7-4, but Johns Creek appeared to even the series at one game apiece when the Gladiators received a bases-loaded walk with the score tied 3-3 in the bottom of the seventh inning of the second game. Lee County coach Brandon Brock approached the umpires with the contention that the Johns Creek runner on second base had not completed the play by touching third base. After a lengthy discussion, the umpires ruled that Brock was correct and, therefore, the winning run was disallowed. The game then proceeded into extra innings and Lee County won 5-3 to apparently sweep the series 2-0 and advance to next week’s state championship. Play Summary: B7, tie game, two outs, bases loaded. B1 walks to force all runners, scoring R3 for the apparent winning run. Prior to the umpires leaving the field, defensive manager files a dead ball appeal asserting that R2 failed to touch third base. Umpires declare R2 out for this base-running error and game proceeds to an eighth inning. The Primary Protest: The Johns Creek HS complaint relies on a so-called NFHS Rule 5.08(b) [4.09(b)], which allegedly states, "When the winning run is scored in the last-half inning of a regulation game...the umpire shall not declare the game ended until the runner forced to advance from third has touched home base and the batter-runner has touched first base." NFHS vs OBR. Click image for larger view of the two rules. The only problem is, naturally, that the NFHS is not formatted as Number.Number(Letter). That's the professional rule's formatting (and yellow is our color for OBR's highlighting), and right there is the problem. Furthermore, the fact that two numbers are listed (5.08(b) and 4.09(b)) is a tell-tale sign this is a professional rule, as OBR changed its rules numbering in 2014, and keeps both the new and old citations on file for reference. Yes, OBR 5.08(b) states exactly what has been cited regarding the runner forced to advance from third touching home base and the batter-runner touching first base, but that's not the high school rule. Related: Arizona walks off with 4-3 win when security guard touches live ball in outfield (8/10/15). Related: Jaksa/Roder Manual: time play criteria do not apply to forced-to-advance runners (6/30/13). Table of specified Baseball Rule Difference, OBR vs NFHS. The High School Rule: The equivalent of OBR 5.08(b) in High School is Rule 9-1-1 Note 2, which states, "When the winning run is scored in the last half inning of a regulation game, or in the last half of an extra inning, as the result of a base on balls, hit batter or any other play with the bases loaded which forces the runner on third base to advance, the umpire shall not declare the game over until all runners have advanced to the next base." See the difference? OBR talks about "the runner forced to advance from third" and "the batter-runner," whereas NFHS refers to "all runners." 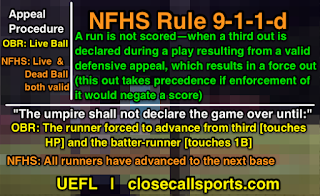 NFHS Rule 9-1-1 EXCEPTION is even more detailed: "A run is not scored if the runner advances to home plate during action in which the third out is made as follows...when a third out is declared during a play resulting from a valid defensive appeal, which results in a force out (this out takes precedence if enforcement of it would negate a score)." Primary Conclusion: Because of Johns Creek's failure to parse the difference between OBR Rule 5.08(b) and NFHS Rule 9-1-1 Note 2, the high school mistakenly believes a rule was misapplied, when, in fact, the rule was properly enforced. This is a slam dunk decision and should never have risen to the level of protest, which GHSA recently stated is prohibited by bylaw unless specifically authorized by the NFHS rulebook for the applicable sport. The NFHS baseball rulebook, naturally, says a protest only is authorized if the State allows for it. Talk about an infinite loop of "don't ask me, ask them." The judgment call of whether the runner actually touched third base, naturally, cannot be protested or appealed. Rule 10-1-4: "Any umpire’s decision which involves judgment, such as whether a hit is fair or foul, whether a pitch is a strike or a ball, or whether a runner is safe or out, is final." Rule 4-5: "It is optional on the part of a state association as to whether protests are permitted. When allowed, protests are permitted regarding rules one through nine only." The Secondary Protest: Though one agency reported the Johns Creek protest concerned non-existent NFHS "Rule 5.08(b)," a competing news organization reported that the protest concerned the umpire's allowance of a dead ball appeal. Apparently, GHSA Coordinator of Officiating Ernie Yarbrough told local WALB-TV that, "The National Federation of State High School Associations rules do not address this type of situation directly. 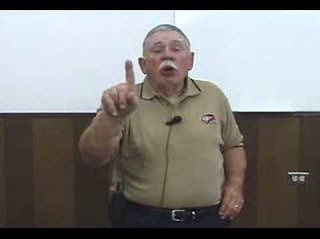 Johns Creek is appealing that no Lee County player ever tagged third base, meaning the runner should not be called out." It looks like Carl is sorely needed in Georgia. Again, this is an attempt to apply a professional baseball rule to a high school game. Under OBR, only live ball appeals may be entertained. Under high school rules, a dead ball appeal may be lodged verbally and without actually holding the baseball. NFHS Rule 8 concerns baserunners, and Section 2 is titled, "Touching, Occupying and Returning to a Base." 8-2-1 requires the runner to touch every base, in order, including any awarded bases. The penalty for violation of 8-2-1 authorizes an appeal, which may be made during a live ball immediately following the play, or a dead ball. We're specifically looking at the final play of the game, for which the procedure states: "A dead-ball appeal may be made by a coach or any defensive player with or without the ball by verbally stating that the runner missed the base or left the base too early...On the last play of the game, an appeal can be made until the umpire(s) leave the field of play." Rule 8-2-6-j states, "If any situation arises which could lead to an appeal by the defense on the last play of the game, the appeal must be made while an umpire is still on the field of play." 8-2-9: "All awarded bases must be touched in their proper order." Related Link: Case Play 2017-5 - Dead Ball Missed Base Appeal [Solved]. Secondary Conclusion: It is absolutely baffling that (1) a team can confuse professional rules with high school rules and rely on the professional rule when filing a formal protest whose submission theoretically requires the team to cite the rule they are protesting, (2) the state officiating coordinator's comments are paired with a situation that is clearly addressed by NFHS rule, and (3) that GHSA is actually entertaining this seemingly meritless appeal wherein their bylaws supposedly do not allow for protests. 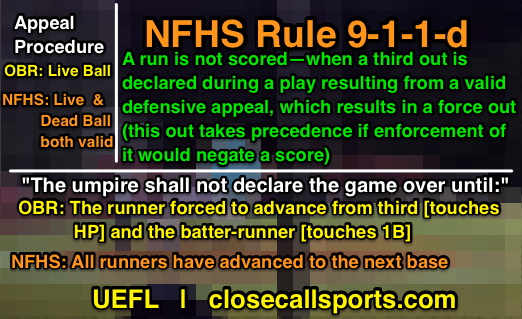 At the end of the day, the appeal decision to declare baserunner R2 out was a judgment call not subject to protest, and all NFHS rules were properly administered, including the dead ball appeal procedure. The only thing about this play that could possibly be subject to protest would be if the umpires had left the field (and thus their jurisdiction ended) prior to the defensive coach's appeal. Only under this circumstance would the call be improper. Gil's Call: It is very sad to see that a school—and a state association—is advocating a protest based upon rules that do not exist for the level at which the game is played, and that these actors are furthering the miscommunication and dissemination of materially incorrect information at a level of scholastic play whose purpose is not revenue nor popularity, but instead is education. My prediction is that the Appeals Board will allow Lee County to keep its extra-inning win, and Johns Creek will feel cheated out of a chance to play for the Georgia State Championship. *Update 5/19*: As predicted above, GHSA's Appeals Board has denied the appeal; game stands as called. *Update 5/22*: GHSA Trustees break precedent & affirm appeal; explicitly cite judgment as rationale.